You are currently browsing the MSBLOG weblog archives for March, 2007. Well it’s finally over – any “free” beta copies of Beta 2 of the 2007 Microsoft Office System have no expired and you’ll have to upgrade to the final version. Lo and behold, you can try the 2007 Microsoft Office System for free via their website for around 180 days. 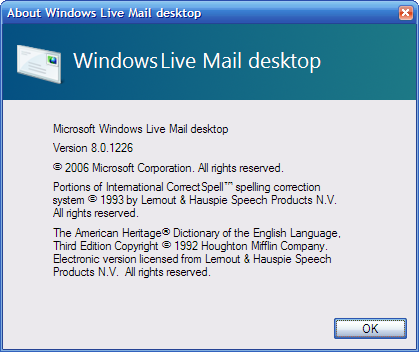 With little news coming over the networks and the wires, Windows Live Mail desktop beta has been refreshed and somehow rolled out. Now this is very confusing, as a little time earlier, my application crashed and caused me to restart.I restarted, and the advertisement pane just vanished. So maybe now the final version wonâ€™t have advertisements? Who knows, the adverts are still around on my Windows Live Hotmail and Spaces pages, so who knows. The new build appears to be 8.0.1226, three builds up from the previous version reported here. No differences are noticed as yet – the beta tags are still in place, and as of 00:43 BST in England, LiveSide hasnâ€™t reported it yet – as it seems, weâ€™re the first people. Check out the screenies below. Make a list or a How-to tutorial: If you look at past Digg posts, you will find an endless number of â€˜Top 10 Photoshop tricksâ€™ tutorials and â€˜Top 30 CSSâ€™ sites lists. To top it all, take this post as an example! Flame the RIAA: Post any story that is negative about the RIAA, it is definitely going onto the front page. Flame the RIAA again! : Flame the RIAA again and make it to the top, twice! You can add in MPAA and Sony too to spice it up a bit! A Witty or Catchy title is always a Bonus: Post your story with a catchy title, this applies not only to Digg but to anything you write. â€˜Why this isâ€™ â€˜How the RIAA..â€™, â€˜5 reasonsâ€¦â€™ are a few examples. Write about Digg and Kevin Ross: Diggers love Digg and just about any news related to Digg and its founder. Write about Google, Apple, Firefox, YouTube, Ubuntu: These are the good-doers in Diggers eyes. Write about them and you will be on the front page (I hope). Câ€™mon how many freaking Ubuntu articles have you seen on the front page?!! Get your friends to digg for you: A friend in need is a friend indeed and this applies to Digg as well. Add top diggers to your friends list and Digg their articles. They might Digg your articles in return and vice-versa. You can also get all your 50+ (MSN) messenger contacts to Digg for you, Hey you can even co-ordinate a massive digging session! Use a fancy profile icon: Looks go a long way. On the predominately white background Digg page, bright coloured Profile Icons stand out. You have more chances of being Dugg if you have a colourful profile icon, as this attracts attention. Classic Version enhancements such as Spell Check, improved Photo Upload Control, and Bi-directional language support. Version Picker (choose “Classic” or “Full”). The Hotmail Team rolls out Milestone updates in waves by server bays instead of all at once. So if you’ve not been updated, give it some time. You’ll know you’re updated once you see the “Windows Live Hotmail” branding in the header. Zack’s Note: different types of user, users from different locations and a number of different factors determine your bay number. Your bay number is found in the address of when you access your Live Hotmail (mine is 9 by the way). Bays related to virtualÂ servers running the backend stuff, and some will be updated before others. Mine already has new branding, whilst my other email account doesn’t. It’ll take time, around 24-48 hours for everything to get re-done. Well, I start doing the translation again. IÂ spent 2 days on this propose in the end of Jan. And I start pick it up again and try to finish it asap. Cause I found someone left message in wf.netfx2.com and asking me if I will do the rest. So….I hope that I would be able to finished all HOL Labs within this month. But it is a very hard job. I wake at 5:30am(because of Jet lag after back from Global MVP Summit 2007 in Seattle), and so I still search around about Orcas, I got confuse on what Orcas acutally is. I know that it is Next VS(might be VS2007 with .NET Framework 3.5). But….I also found the Windows SDK for Vista are called Oracs_Mar07CTP in the description….hm….then….Orcas is including Windows SDK too? Well, I found all I need the most is …..WF. And…I should start from basic first. So I found the first item I should choose is….(1). Then….should be (2). SoÂ I start my work on rest of Lab04. When I complete the Exercise 1 of Lab04, I cannot run it successfully. I search around and around, find many people saying that they have the same issues. I found many developers are trying to interact WF with ASP.NET2.0. But it is not a easy job but I think many companies(even in HK) will ask the developers to do so. Well….until 3:30pm, I still cannot solve it. What happen to my VB one? C# is working and I just do the translation…..I take a rest and don’t wanna think about it any more for a short time. I start my work again at about 10pm. I found there is a MSFT guy who answer a lot from this issue in MSDN forum, so I try to send him my source code and ask him if he can help. After I sent the email for 2-5 mins,Â a light comes up. I try to see my workflow project, get into every State and look at the HandleExternalEvent Activity. GOD! I made mistake on the Initial State. That is why the program cannot run it. Correct it and it works. Thanks god. And then I received that MSFT guy’s email and telling me the same stupid thing I found. He is really good, within few minutes and he really do help me and found the point. Microsoft has built into Vista a function that allows anyone to extend the operating system’s activation deadline not just three times, but many times. The same one-line command that postpones Vista’s activation deadline to 120 days can be used an indefinite number of times by first changing a Registry key from 0 to 1. This isn’t a hacker exploit. It doesn’t require any tools or utilities whatsoever. Microsoft even documented the Registry key, although obtusely, on its Technet site. But dishonest PC sellers could use the procedure to install thousands of copies of Vista and sell them to unsuspecting consumers or businesses as legitimately activated copies. This would certainly violate the Vista EULA, but consumers might not realize this until the PCs they bought started demanding activation â€” and failing â€” months or years later. The following describes the Registry key that’s involved. While running a copy of Windows Vista that hasn’t yet been activated, click the Start button, type regedit into the Search box, then press Enter to launch the Registry Editor. Right-click the Registry key named SkipRearm and click Edit. The default is a DWORD (a double word or 4 bytes) with a hex value of 00000000. Change this value to any positive integer, such as 00000001, save the change, and close the Registry Editor. Start a command prompt with administrative rights. The fastest way to do this is to click the Start button, enter cmd in the Search box, then press Ctrl+Shift+Enter. If you’re asked for a network username and password, provide the ones that log you into your domain. You may be asked to approve a User Account Control prompt and to provide an administrator password. Either command uses Vista’s built-in Software Licensing Manager (SLMGR) to push the activation deadline out to 30 days after the command is run. Changing SkipRearm from 0 to 1 allows SLMGR to do this an indefinite number of times. Running either command initializes the value of SkipRearm back to 0. Reboot the PC to make the postponement take effect. Read full story and other tricks at source. Stand before him and clothe thy body in red. Offer unto him thy technology, screens great and small glowing with the holy light. Polish thine head until it reflects verily like the convex back end of a stainless steel milk truck. And when thou has done so, chant the incantations at a sharepoint service. Invoke replication across a broad server farm. SELECT * from Authors. Tie the unholy scripture in broad ribbons woven with HIS icons. And when he has left the stage, endure penance as the lesser priests drone the unending chant, at least until 5:00. Tomorrow will come and the mysteries of Microsoft Office Project 2007 and Microsoft Office Project Server 2007 (MOP and MOPS – sorry Brian) will be revealed. Windows Server 2003 SP2 and WinXP x64 SP2 have released! Service Pack 2 for Windows XP Professional x64 Edition will also be available integrated with the operating system. Today’s release includes editions for English and German. Other languages will be released in the coming weeks. You may visit http://www.microsoft.com/technet/windowsserver/sp2.mspx to get official builds, tools and documentation related to this release. Posted in Windows Server System, Windows XP | Comments Off on Windows Server 2003 SP2 and WinXP x64 SP2 have released! As Jabez said, we are now in Seattle for the MVP Global Summit 2007. The registration will be starting tomorrow. We will try to write something that are not under NDA. Today Daniel and I met Patrick and Jabez. We had a breakfast in Subway and also took a mini-MVP Dinner with another 14 MVPs. Please allow me to share some photos with you. 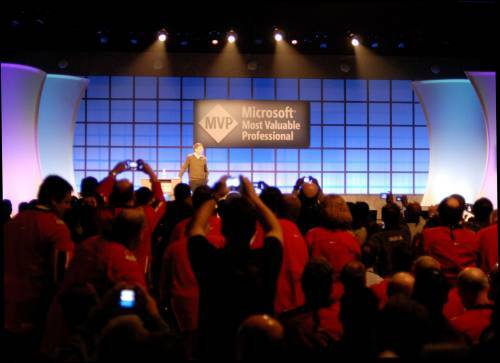 This year, Microsoft will again be hosting the MVP Global Summit 2007 in Seattle. Ken, Daniel, Joseph and me from MSBlog will be attending the summit. Most of the things that is being covered during the Summit 2007 is under NDA, but we’ll try to give you insights on the non-NDA informations. Some people have questioned me over the last week or so asking, â€œare you leaving Microsoftâ€ and all this. Letâ€™s get something straight firstâ€¦ I was never Microsoftâ€™s b***h and never will be. Iâ€™ve worked with the Windows Live guys now for little less than a year starting off on Messenger and Spaces and moving on to web safety. Web safety (or rather as itâ€™s now known as family safety as itâ€™s more appropriate) means an awful lot to me. Iâ€™ve got a young goddaughter and a much older sister who uses the Internet and to be fair, there are all kinds of weirdoâ€™s out there who would love to bury their faces into a youngâ€™un and it makes me sick to the core. Being a younger gentleman, I have added advantages of being young and having that special perspective which a lot of other people have. I started really young â€“ most people could never say theyâ€™ve worked with some of the amazing people I have by the age of 15, and now Iâ€™m 18 and have met even more influential people, it makes me glad I started testing in the first place. The Windows Live division, more specifically the family safety section is undergoing a major restructuring backend with people being shifted around from place to place, even if theyâ€™ve been doing that job for a good length of time. Family safety is really important to Microsoft but from my perspective, itâ€™s being put off more and more because people are being shifted around. Someone Iâ€™ve done work for, Jo who worked on the family safety products for some time, isnâ€™t working on it anymore; that really saddens me as I know she loved doing it. From what I understand, a big head of citizenship (of which the family safety comes under the hood of) has been replaced which will mean itâ€™ll take months to find someone else let alone the time to bring them up to speed with whatâ€™s going on. There arenâ€™t the resources available, nor is there enough money to really push forward with some of these great ideas which have been bounced around internally. Because of this, people have already reported that the Windows Live OneCare Family Safety product wonâ€™t be around until the summertime. The product is pretty much nearly done and I suspect one of the reasons why itâ€™s not moving forward is because of the lack of resources and people. There are some interdependencies here and there however, like needing to interact with other products and ensuring that other teams are on track so that the Family Safety product can move forward. Weâ€™re talking about Microsoft, one of the biggest and most wealthy organisations in the world, and there isnâ€™t the money to do these things, to protect the kids online from the things they should never have to experience. Iâ€™ve had a whole wave of ideas which could seriously improve the family safety side of things within products and existing solutions, but because of the lack of money and people being busy with hiring new leads of citizenship, these ideas are all pending for a good 6 months. Now maybe itâ€™s because Iâ€™m young and stupid and naÃ¯ve, but can the kids of this world wait another 6 months? These threats are getting more intense every day and its Microsoftâ€™s products which are central to these because theyâ€™re so popular with the users. Itâ€™s not Microsoftâ€™s fault that these services are being exploited; itâ€™s their fault for being so popular, which is hardly a bad thing. This is why I focused on Microsoft for the web safety â€“ because they have the products and the services which are being used and that could be improved and secured for the younger generation. One thing I can be super proud of â€“ is that Iâ€™ve greatly contributed to improving the Windows Live OneCare Family Safety filter with the help of Jo, and thatâ€™s something which Iâ€™m proud of. Some of the people Iâ€™ve worked with â€“ my God, just brilliant. Iâ€™ve had a â€œmentorâ€ being Philippa, and without doubt the best â€œbossâ€ Iâ€™ve ever had. Cristiano, Dev, Andy, Jo, to name a few â€“ itâ€™s been a good stretch. But for the time being, Iâ€™ve only really got to say this as I wrap it up. Iâ€™m not leaving Microsoft as I was never really part of it in terms of a paid full time position. For the time being, Iâ€™m stepping back for some time, letting things mull over, Iâ€™ll still do the odd bit here and there no doubt but itâ€™s time to focus on me and me only. I need to get past these next few months and finish my further education, and head on to higher education at university starting this September/October. Who knows whatâ€™ll happen nextâ€¦ I guess Iâ€™ll just have to take things in my stride and let things happen as and when they do. Windows Live OneCare Family Safety has been updated to a Beta 2 refresh status. Current users will get a notification through asking you to update, new users will be able to download it from the website by tomorrow morning.